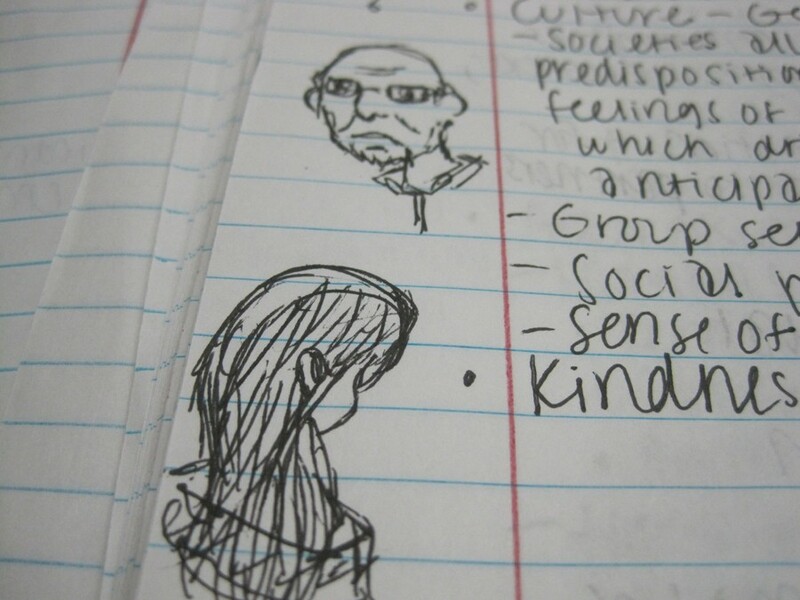 Anne Le is a Human Biology & French major, and she draws "Horrible Things" on standby for the Page. 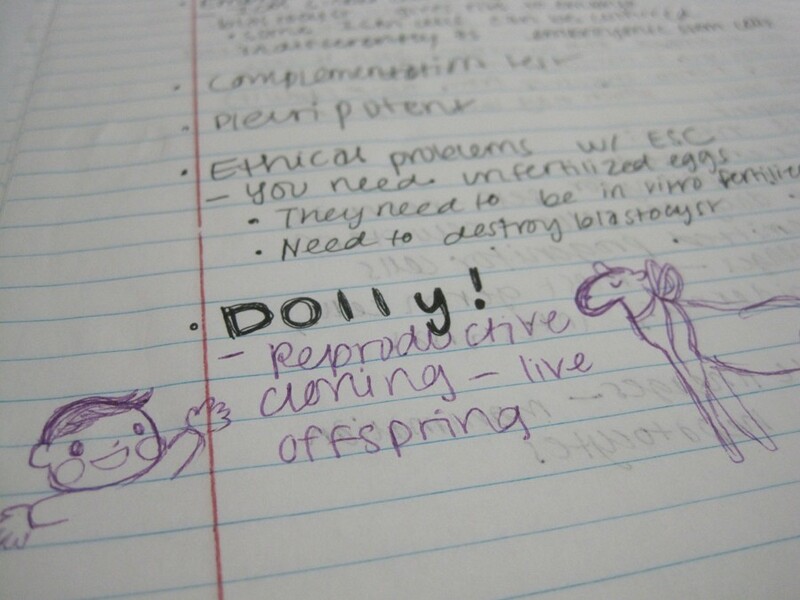 I am double majoring here at UT, which means I’m in class during most waking hours. 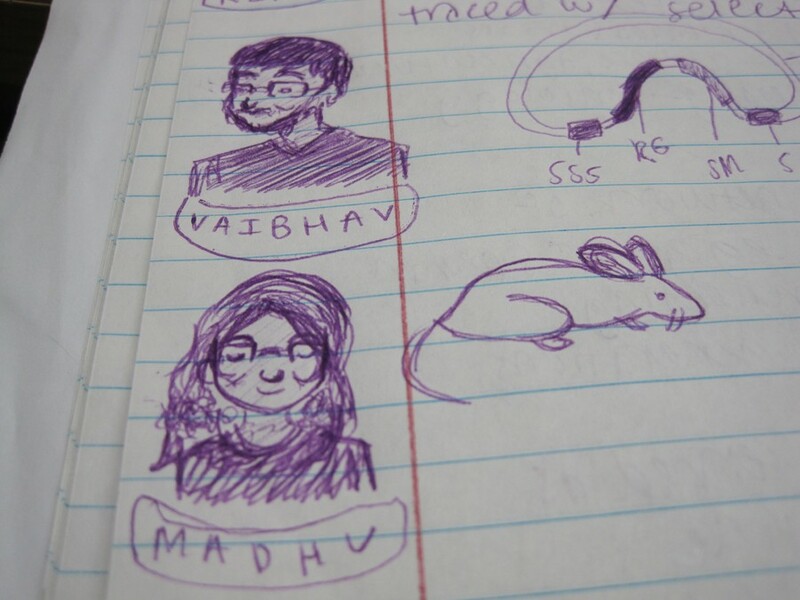 This offers me ample time to daydream and doodle. 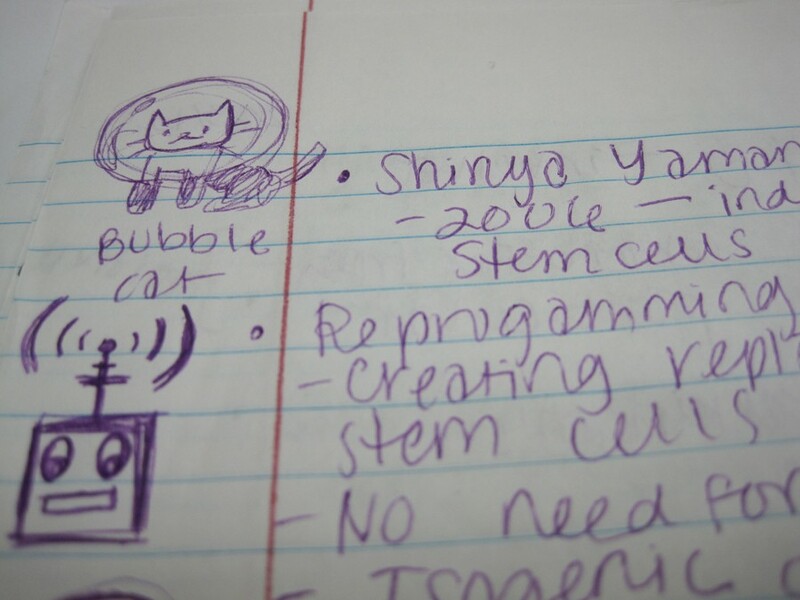 There are definitely some classes that facilitate such a hobby more than others. Oh, if my parents only knew where their precious money was going toward. I don’t consider myself to be an artist or cartoonist. 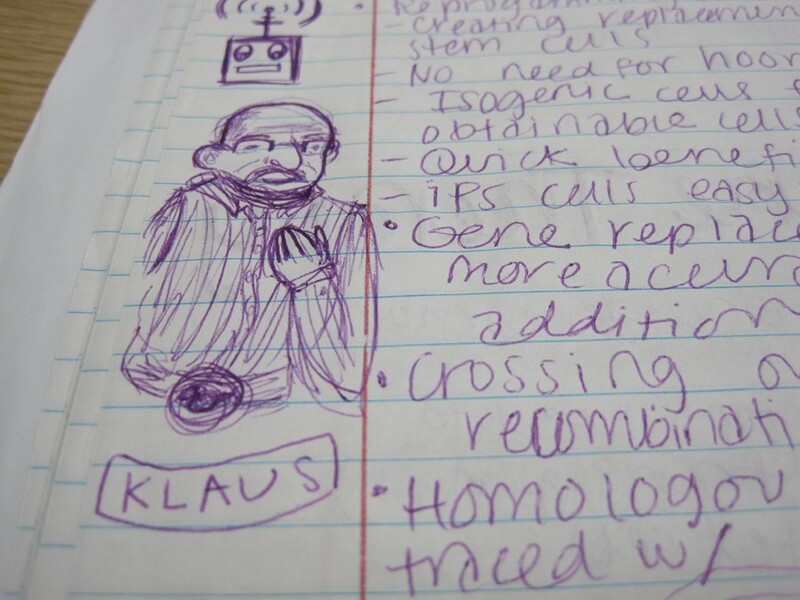 Seeing as I have no formal training, I consider the fruits of my minimal labor to be mere doodles. This lighthearted approach to any semblance of art is refreshing and takes the pressure off of things such as the comics I draw for The Daily Texan. 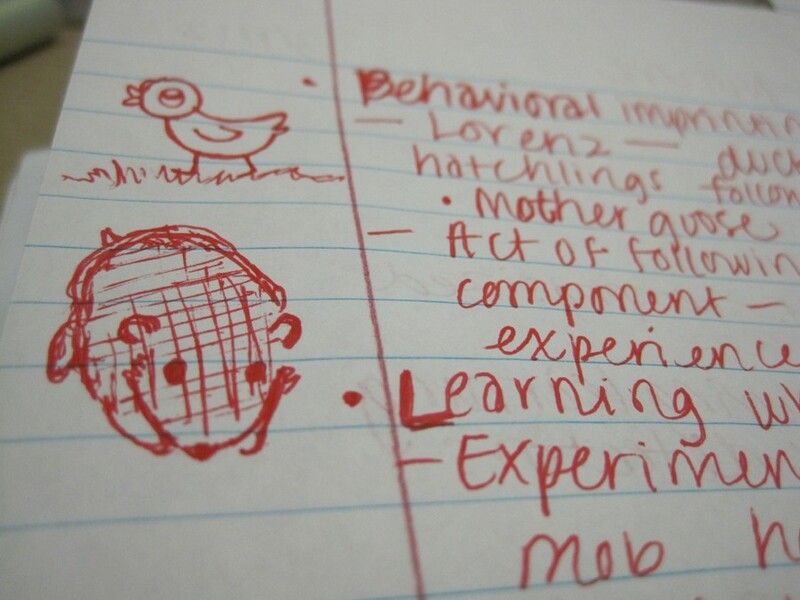 My doodles done in class are typically loosely inspired by what’s going on in the lecture. It lets me pretend that I’m still engaged in whatever is going on around me. 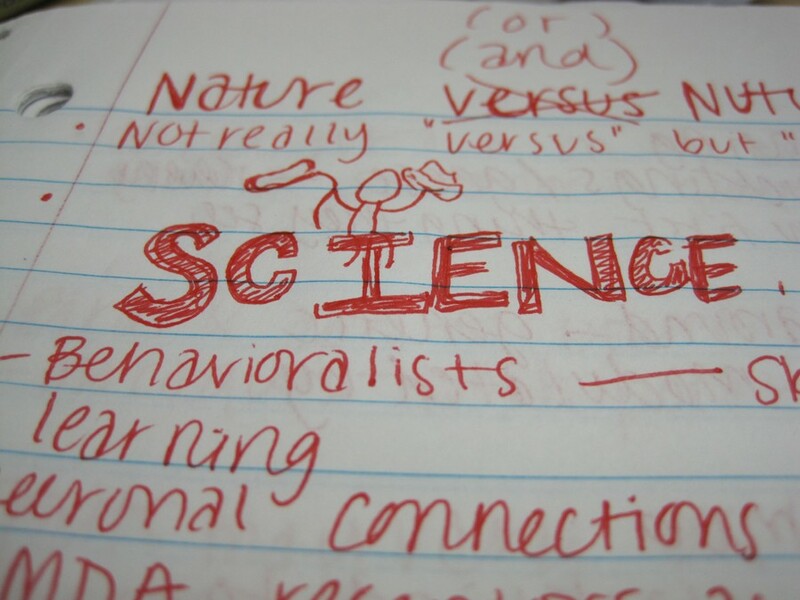 Editor's Note: Carlos Pagan is a freshman RTF student, and has a strip that runs on Tuesdays and Thursdays. His work is highly informed by traditional caricature art and is a constant switch up of instruments and materials. This video was created as part of an aborted April Fool's day project with other cartoonists on the page, but he spent a lot of time working on it and it might as well be posted here. Is That All There Is? 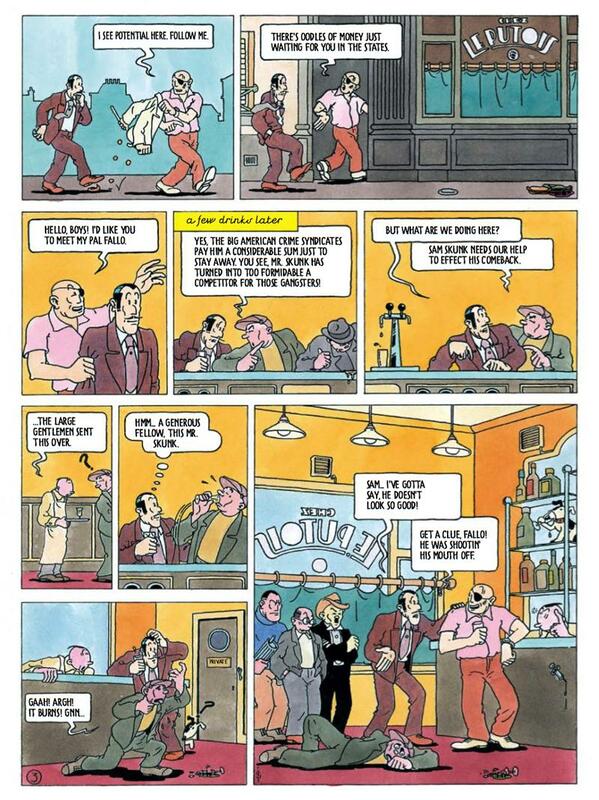 is a collection of comics by Dutch cartoonist, graphic designer, and European cultural icon Joost Swarte. The first English-language Swarte collection of its kind, the book features rare, out-of-print or untranslated work dating back 40 years. Swarte’s overt appropriation of Herge’s style takes an interesting stance on the issue of creating a cartooning vocabulary, as style is often the most instantly defining characteristic of a cartoonist. Most artists’ styles, under close inspection, are comprised largely from elements borrowed consciously or unconsciously from their influences. Swarte sidesteps the entire task of amalgamating influences into something original, by tacitly admitting Herge’s influence and taking it from there. 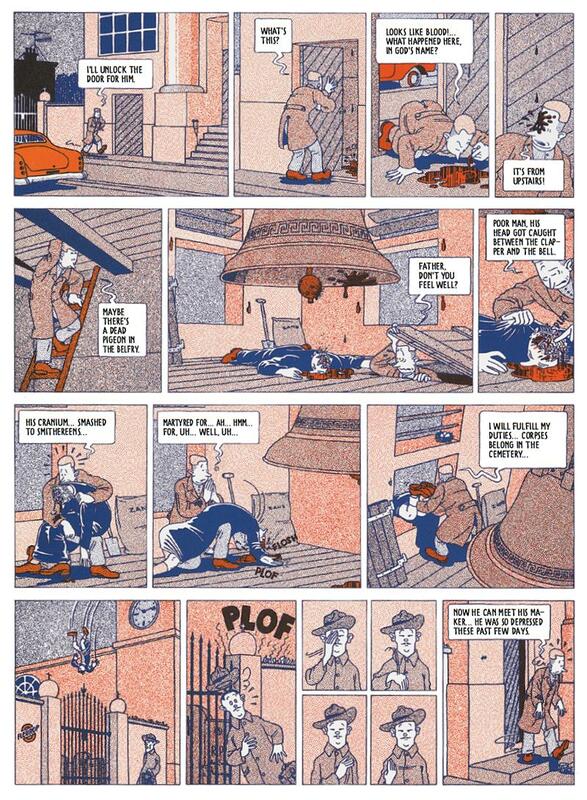 It is clear Swarte doesn't need to rely on the Tintin style to make his visual point. This sharp linework is filled by a warm, dot-patterned color pallet and exists in a world littered with visual treats hiding in the background. Highlights include doodads like a wall-lamp designed like a saw cutting through wood. Similarly, Swarte populates his streets entirely with post-modern architecture. This is especially noteworthy considering most of the work included in the collection is drawn from the mid-70’s, before the post-modern architectural boom of the 80s. Swarte certainly had a finger on the pulse of a variety of mediums. Swarte’s narrative style is decidedly post-modern as well. 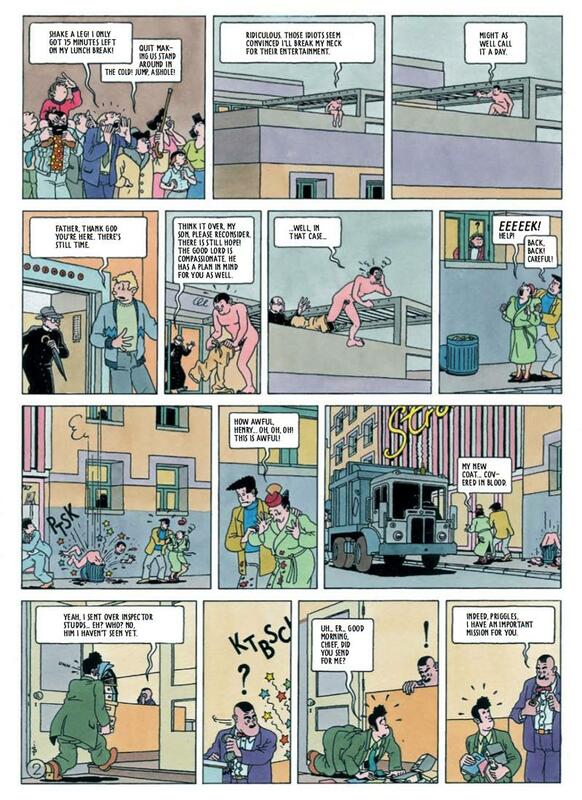 Most of his comics feature themes of misfortune and suffering, approached with a lighthearted or even comical attitude, perhaps also borrowed from Herge. It seems his stories are specifically structured to deliver this misfortune to its characters, ending abruptly after some schadenfreude punchline is reached. Yet, despite these dark undertones, which don’t exactly paint a picture of faith in humanity, Swarte’s work still manages to come off as incredibly endearing, perhaps due to his obvious love of the craft. The book features a comic strip explanation of the dot-screen coloring technique Swarte employs with vim. A handful more of the stories are revealed to be a character’s fantasy or dream, perhaps as an allegorical homage towards Swarte’s attitude towards fiction itself. As a whole, Swarte’s nihilistic storytelling take a backseat to his sharp, sophisticated style and sensibility. 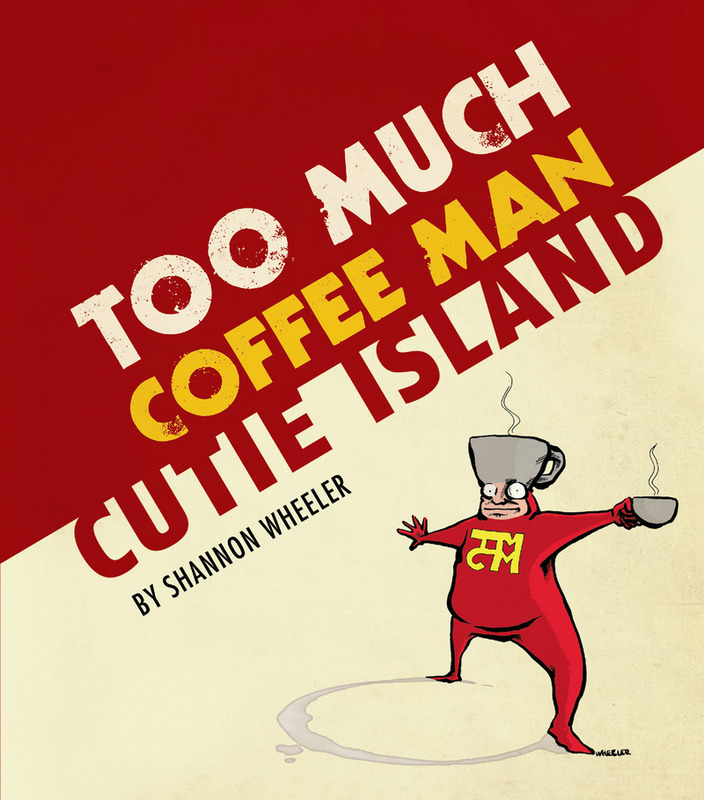 I recently picked up comic artist Shannon Wheeler’s newest book Too Much Coffee Man: Cutie Island (BOOM Studios) at Austin Books and Comics. What drew me to it initially was the bold cover, with its contrasting red and off-white colors, the frantic looking title in all caps, and interesting looking character in a tight red superhero outfit and coffee cup-topped head. From cover to cover, there was a fantastic visual and conceptual style that flowed through every page. Even the table of contents made me laugh, because it cites the cover as “page -1” and proceeds to give a name to almost every page, including “Credits and Legal Stuff” and “I Should Have Known Better than to Have Trusted Someone Who Wants to Eat You.” The comics were drawn with beautiful, subtly wavering lines that gave a nice movement to the different characters, from humans to cute animals to bizarre monsters. The stories are slightly dark and often depict depression, bad relationships, losing one’s sense of direction or wanting more out of life, but Wheeler projects on these a witty and satirical angle, giving the reader something to laugh about as well as something deeper to contemplate. Among other things, Wheeler is an Eisner Award winner, Harvey Award Nominee and contributor to The Onion and The New Yorker, and his character Too Much Coffee Man is the star of an opera. He puts up a daily comic at www.tmcm.com. After reading the book, I was lucky enough to get to ask Shannon Wheeler a few questions. 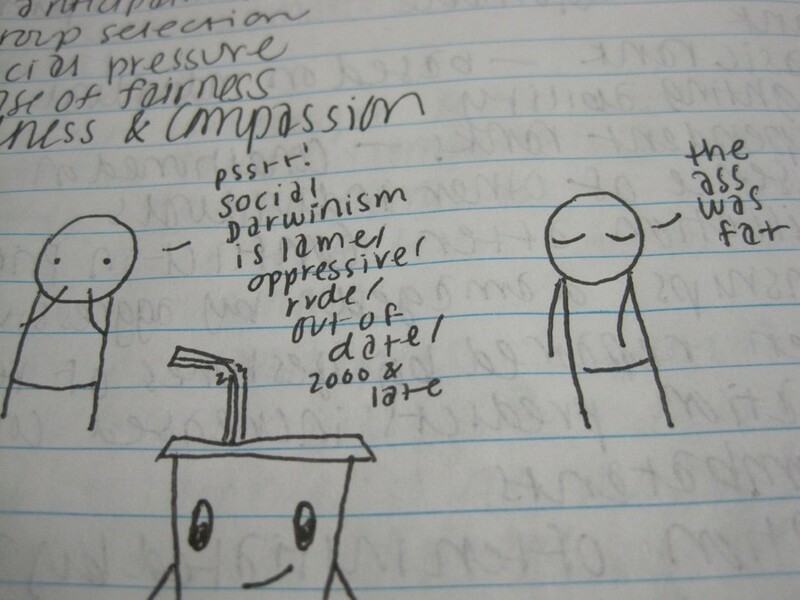 Daily Texan Comics: How did you come up with the character Too Much Coffee Man? Shannon Wheeler: I collected a bunch of cartoons from the Daily Texan into a collection called Children With Glue which I started selling at comic book conventions. I made a Too Much Coffee Man mini comic as a promotional for the book. My thinking was that people would buy a comic for a quarter, like the material, then return to buy the five-dollar book. They came back to buy the book but stalled when they found out there was no Too Much Coffee Man in it. I started drawing more Too Much Coffee Man. I thought he’d be a one-note joke but he ended up resonating with something inside me and became a real vehicle for me to express myself. DTC: How did you decide which comics to group together for Too Much Coffee Man: Cutie Island? SW: It’s all previously unpublished new material from my weekly strips. I tried to take to the best comics. DTC: Who was your favorite character to draw in this book? SW: Too Much Coffee Man is the most fun to draw. I did love drawing the squid too. DTC: Although it made me laugh a lot, much of TMCM: Cutie Island is pretty cynical. What draws you to exploring themes like loneliness and loss of direction in your comics? SW: Cynicism and loneliness are close cousins of humor. I’m not always successful but I try to explore real themes and ideas. 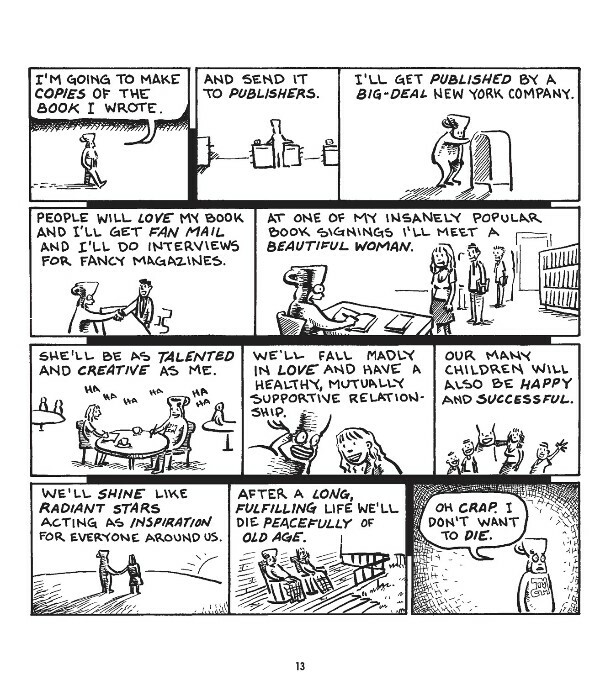 DTC: I noticed under one of the relationship comics in the book you noted "… if you don't want cartoons about you then don't date a cartoonist." I liked that. Are your stories often inspired by real experiences? SW: Most of the comics are coming out of someplace real. Sometimes I think that it’s too real for me to express — that I’ve made myself vulnerable — but that’s the edge that’s important to find. DTC: Do you have plans for any more books (or operas) in the near future? SW: I’m working on a couple of collaborative projects. Grandpa Won’t Wake Up sold well for my publisher and so simon max hill and I are working on a second kid’s book; the Drunk Family Goes Swimming. Yesterday we brainstormed 15 different ways to drown (including, but not limited to, kiddy pool, creek, one’s own vomit, and water boarding). I’m also in the editing stage of working on the Bible with Mark Russel. I’m doing the gag cartoons. This week I’m working on some new stories for Dark Horse Presents. Hopefully we’ll be re-staging the opera again soon (we’re talking to some people in the Bay Area and Albuquerque).